Whether you manage office buildings, schools, health care facilities or another type of property, some common plumbing problems are likely to creep up from time to time. Three common complaints property managers may deal with are clogged drains, leaky faucets and sewer smells. Unless you manage apartment complexes, you'll likely be dealing mostly with clogged kitchen sink issues in commercial facilities. Bathroom sinks in such facilities don't tend to become clogged unless there is a structural issue, because employees and customers are likely to use them only for hand washing. Basic clogs in commercial sinks are often treatable with a plunger. In more extreme cases, call in a plumber who can snake the drain to remove build up or blockages. If blockages become an ongoing issue and no major plumbing problems are found, consider sending a memo to renters detailing good sink practices, such as not washing solid foods down the drain or pouring grease into the sink. Dripping faucets are usually one of the easiest plumbing fixes, often requiring a simple washer replacement. Staying on top of leak situations is essential, as a leaking faucet can waste thousands of gallons of water each year or result in a slow spread of moisture that allows mold issues to develop. Ask tenants to notify you as soon as a leak is noticed, and resolve the issue immediately to avoid more expensive repairs. Restrooms and break rooms in commercial buildings get a lot of use, so it's not surprising that sewer smells are an occasional complaint. The only thing keeping sewer smells from rising into restrooms is a bit of water normally housed in the u-shaped pipe below every drain. When that water isn't present, gas from sewers or sewage tanks can rise into the building. The water in the pipes occasionally dries up, but the problem is easily solved by treating drains with liquid odor block a few times each year. 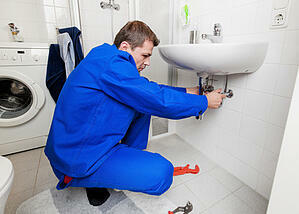 Most plumbing problems start small before becoming major, expensive issues. By working with commercial tenants to keep an eye on plumbing situations, property managers can reduce maintenance costs and protect the building.